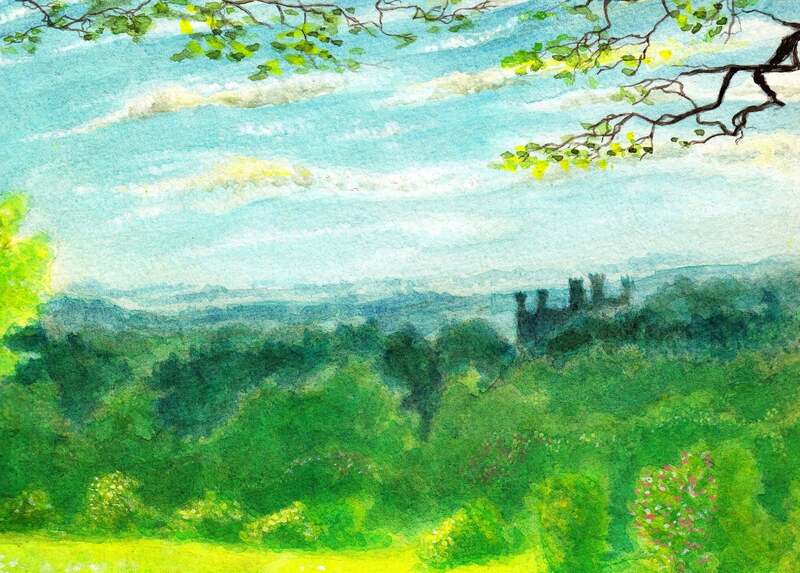 Castle View is part of a illustration I created on A2 Bockingford watercolour paper that was too large to be copied in its entirety via my scanner. It has been cropped and displayed as three separate entities titled; Robin Hood, Castle View, and Castle Landscape View, all of which are available for view in the Landscape section of this website. There is a separate entry taken from a postcard sized photo small enough to be copied in its entirety with my scanner. Being a pre-digital photo when true colouring during development of the film could not be guaranteed and often wasn’t, this image offers an alternative tonal aspect of the collective image with the colouring muted in a more misty representation, as if on a dull and cloudy day. As shown below, it bears the title: Outlaw of Sherwood, and is located on page 2 of the Portrait section.